Today is December 31, 2011, and tomorrow will once again bring a new year unto all mankind. Father time marches on, while the worn old 2011 disappears giving way to the youthful 2012. I suppose it is a time of reflection. It shall be a moment of truth in a year of trials and tribulations. This will be the 74th time a new year has come about since I was born in 1938. As all leap years are divisible by four, this must be one. My daughter, born on leap day (February 29th) 1964 finally has her 12th birthday. I’d like to say she was sweet sixteen and never been kissed, but she has four wonderful children, is a grandmother, and I suspect the statement would be untrue. This has been the year of the usurpations in many Arab countries, known as the Arab Spring as they began in that season, Tunisia, Egypt, and Libya have all succumbed to citizen uprisings and are in some sort of process of attempting more democratic societies. Yemen and Syria are rather following in their footsteps at present. I wonder why we celebrate the New Year, and further why on this date? What is there to celebrate about the fact we have completed a trip around the sun. What makes us think that our trip around the sun, or a year, started and completed on this date? Personally a better date would be closer to the Vernal Equinox. Our year should begin with the budding of spring, continue through the growing season, the harvesting season, and the resting period before another strenuous year begins. For your information this visit from you is one of about 3,000 to this site this year. During those 3,000 visits about 4,500 pages were scanned. I’ve no idea why, but if you enjoy, then I’m happy. I’ve touched on a goodly number of subjects during the year. I hope you found something of interest. This photo is of the abode of Bucky and Eager Beaver taken on today’s date. It is located at 44, 40’ 56.62” N and 75, 22’ 16.11” W if anyone wants to Google Earth their position. You can’t see it though. They have been mentioned many times throughout the year. I know a man who will not kill a fly. If one is bothering him, he will do his best to shoo it out an open doorway, but if he finds that somewhere between difficult and impossible he will allow the disturbance it presents. This same man, who is 62 years of age, has never learned to drive an automobile. He rides a bicycle wherever he travels in summer, while he walks in winter. No, he is not Amish, he is eccentric. He never married, but is not gay. I don’t know if that is a conscious decision, or merely he never found what he never searched for. Being a confirmed bachelor seems not to bother him in the least. He loves animals, owning several cats and dogs at any given time throughout the years that I have known him, which amounts to more than forty. That is years, cats, and dogs. I know a woman who will not kill a fly, merely paying as little attention to one as she can. She has several cats and a dog, but unlike the man above, she also has a spouse. They have been happily married for at least thirty years, and seem not to have suffered any dire consequences from that union. She drives a car, and in fact is the main bread winner for the family as the husband lacks the fortitude to work for a living. She has dutifully driven to work for all of the years they have been married while he has worked only sporadically, and hardly ever for anyone else. She believes in a bit of an odd religion, while her husband believes in none. When they were younger they each lived in a hippy commune. All three of the above people are college educated with bachelor degrees from well-known institutions. The first gentleman is graduated from a highly regarded art program. The lady was a major in language and has traveled to Europe and Australia while studying same. She tends to worry too much, about such things as the great flu pandemic, and other such world problems that nobody cares about except the news reporters trying to drum up something on a quiet day. Eccentric people are not crazy, they are sometimes a perfect example of those who “march to a different drum” as paraphrased from Thoreau. Their thinking is not wrong, merely different in many respects from the norm. I find these people exhilarating to be around as I never know what they will say next. Often it is off-the-wall, but makes for an unusual conversation that you are very likely to learn something from if you pay attention. The next time you hear someone say something a trifle unusual, instead of looking askance and leaving, invite them to a cup of coffee and listen a little more. You’ll be glad you did. I am just returned from my afternoon refreshing trip through forest and meadow on my ATV. Although nothing exciting happened by some people’s standards, I found it invigorating to be out and about on such a nice afternoon. It is overcast, but a very mild December day two days past Christmas. As I proceeded back through my meadow I noted a plethora of deer tracks. I don’t necessarily have to see the deer to know they are nearby. Even though I hit one with my truck and killed it less than a week ago, I hold no grudge, and I’m happy that some survived the recent hunting season to begin the new year soon. I find them to be one of the most beautiful animals on earth. 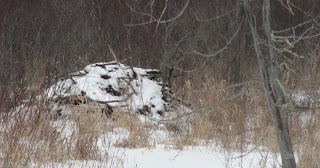 I continued on my way through the small amount of forest on my land marveling at the amount of deer tracks where they had meandered in their never-ending search for nutrition. In a matter of minutes I was through my woods and entering my neighbor’s meadow. I turned to my left to follow the edge of a copse of woods along that side of the meadow. Within seconds a flock of some forty Canadians passed overhead headed southward. I hadn’t seen a flock in many weeks and found it surprising there were yet some in the area. They must have been located in some waterway where feed was sufficient if not too plentiful. As I continued on my way, it was a mere minute or two later that I spied some birds over to my right and ahead. It took a couple of times of getting my eyeballs on them among the cut off corn stalks before I was certain I was watching a small flock of wild turkeys. I’d guess it was a hen and her this year’s brood as there were around ten or a dozen in the group. They had spotted me long before my sighting of them I’m sure, and it was but a short few seconds I noted them before they were out of sight. Continuing on my way I rode to the beaver pond. I saw none of them, but like the deer they leave some telltale sign of their presence. Here I noted where they had broken the thin covering of ice near the sluice pipe plug they have for a dam. I am coming to the conclusion they are using this as a means of controlling the pond water level to their liking. As I think about it, I used to think they wanted as much water depth as possible, but now I believe that is not true. Once they get the water level high enough for their use, and have built a house, they cannot allow the pond to increase in depth any longer, or it would flood their home. Now that they have a home built, and are preparing for winter, they must open a spillway some to maintain the water level where it is. I left my musing there and drove over to the new pond of Little Beaver. Like daddy Bucky’s pond the new one also has an open area in the water, but it is around where Little Beaver has a bank den burrowed in. It will be interesting to see if he keeps it open all winter or not. He has a sizable stash of limbs and twigs in the water in that area for winter food. I traveled on toward where I had last seen the turkeys, but as I suspected, I was not to see them again. I found where they had entered a wood on the north side of the meadow. Deer tracks abounded along that side of the meadow as they had on the south side where I had entered. In a few more minutes I had returned to my own woods, passed through, and took a trail northwards towards yet another neighbor’s land. It is about a four acre lawn surrounded by woods on the three sides not toward mine. I saw no more animal life, but enjoyed following a deer’s tracks up through my horse pasture. It had continued through an open gate onto my snow covered lawn, passed under an apple tree, and checked out the area under my wife’s bird feeder. It obviously likes the corn and sunflower seeds in the bird feed. I then put my faithful ATV back in the garage, and marveled at all of the enjoyment I had got from a simple ride through some local area on a mild 39 degree afternoon. I was doing the outside like some little gnome. Next year at Christmas not to be found. That was just before I plunged to the ground. She said get off of that ground, why are you sleeping? She said I’ve got it all done, but I think that she lied. She said to me then, take it all up the stairs. That’s when she decided to show me the shelf. I even promised that I’d do the dishes. She slowly methodically swayed across the floor to the music coming from the set of musical bells that thirteen-year-old Meg had given her. She pushed the switch on again to hear once more their tinny rendition of White Christmas, before slowly removing them from the nails pounded into the casing above the door. She held them closely to her breast as she remembered the smiling face beaming at her as she slowly unwrapped them so many Christmas’ ago. Meg had always been the willful child, with not much thought for others as she had grown up, but on that Christmas she had either made or bought presents for everyone in the family. Beth smiled wistfully as she remembered Billy’s awe struck face when he opened up the Red Ryder BB gun. Beth didn’t think he ought to have it, but how could she say no when Meg stood there with a smile from ear to ear, basking in her newly found heroism. Beth started to say, “Megan, you shouldn’t ha….,” but the words trailed off into nothingness as radiance turned his boyish freckles into warm little spots of joy. Then Beth had opened the little package so tenderly wrapped that had “To my dearest mother, from Meg” on it. As the little red bells spilled out one by one onto her lap, they began to jingle the little tune, all by themselves. Tears spilled down her cheeks, and dropped one by one onto the tiny bells as she remembered how she had been telling Meg for weeks she was spending her hard earned babysitting money foolishly, as it seemed she never had any left over at the end of the week. The little tear-stained spots were still visible if you held them up to the light at just the right angle. Beth had cried a thousand times since that day, but seldom in happiness again. It was later that Christmas Day that Meg and Billy had both dressed in their warmest clothes and went on the hay ride with Mr. Jenkins from down the road. Every year old Tom harnessed his horses, loaded some baled hay on his wagon, and drove the neighborhood children over hill and dale, through the woods, and across the meadows. Laughter and talk could be heard from long distances as they traveled in the frosty evening air under the bright light of a full moon. The hoof beats were muffled in the soft snow, but the harness’ jingle was music to the ears. They started across the road heading toward Hank and Hilda Barnes’ place for warm cider and hot molasses cookies when the happy, celebrating, drunken driver crashed into the wagon. Thankfully all of the children survived with only minor injuries, except one. Once more Beth held the tiny bells to her breast as she touched the tiny switch again. Somehow it almost seemed as if Meg was back with her. At one time used car salesmen were the scum at the top of the pond when it came to the useless objects cycle. Although they haven’t gotten any better lawyers have seen fit to rise, like cream on milk, to the top, surpassing the sneaky false promises of the low-life automobile salesmen. Although it would seem to be impossible to top the antics of those two categories, it has now become obvious that those in the advertising market have them beat by a mile in the race for obviously non-usefulness. Advertising serves no useful purpose what-so-ever except for the interests of those doing the advertising. They prey on the unsuspecting public like hawks in a wilderness setting. There are always a group of them perched in some unusual spot watching to see where they can attack the public in a new way that it is hoped the populace will never see coming. There is an entire hierarchy just waiting to descend on you, and you, and you. The worst part is, that they cause you to pay for this stupid intrusion in your life. Each advertising person convinces a retailer that they need to hawk their wares in order to insure they get more than their greedy share of the buying public’s money. Guess who will take care of that needy chore for the seller of goods? The advertising man, of course. Who pays for it? The retailer you say. Well you’re correct in the short run, but in the long run it is YOU. Every time you buy one of the widgets the retailer is selling you are paying an additional cost tacked on by that same person. After all it would do no good to advertise and sell more of them if it cost him money. If it costs you money he doesn’t care, as long as he sells more than his share of that product, and obtains more of your money than his competition. Over one third of all television time is wasted on this form of stealing. Stealing what? Stealing time, the only thing you are given on earth. You have a finite amount of this gift when you are born, and these greedy advertising people devise every method imaginable to steal it from you. Newspapers and magazines are littered with this useless crap. The internet, by which you are reading this, is saturated with the garbage they spew. Whatever happened to honesty and integrity in the retailing market? While stationed in VF-174 at Cecil Field near Jacksonville, Florida in the early 60s I got a chance to buy a boat. At the time it seemed like a good idea, but time would tell that maybe I wasn’t cut out to be a boating aficionado. The boat I managed to purchase and call my own was a used wooden 12’ model with an outboard attached to the back end. It was painted up a beautiful white with red trim, and you couldn’t imagine it had a rotten spot in it anywhere even if it did. I had spent some time in the hospital at Naval Air Station Jacksonville which is a different base than Cecil Field and they are maybe a dozen miles apart. I lived on an almost direct route between the two stations about four miles from Cecil Field in the direction of NAS Jacksonville. In my many times I drove to NAS Jax I passed over a waterway on a bridge located on Timuquana Road. The water there looked ever so inviting there and I noted a local boat ramp where one could put a boat in the water. Once I was a boat owner this seemed like the ideal place to put my boat in the water and enjoy all of the pleasures known to boatsmen the world over. So it happened one fine evening after working hours were done for the day I hitched my boat and trailer behind my Ford sedan and headed for the boat launch ramp. My wife was not too sure about this whole boating thing, but she agreed to try it at least once. We arrived at the boat ramp in a matter of minutes, unloaded the boat into the water, started the engine and headed merrily up the bay we were in to the north. This creek, or whatever it was, led to the St. John’s River. Soon our little outboard was whirring merrily away as we cruised down the creek which led to yet another larger creek, bayou, or something or other. After a half hour or so I turned around and headed back to our launch site hoping I wasn’t lost nevermore to find my way back off the waterway. On my southward return I steered a course along the west side of the waterway or to my right in the direction I was traveling. I was near the bank as it seemed safer there than out in the middle of the stream and I was none too sure of this entire undertaking myself. As we slowly made our way down the creek bank we were passing under trees occasionally growing out over the water. As we approached one of these trees covered with Spanish Moss hanging down, just before going under I noted, of all things, a snake hanging down from a lower limb. I had never before that time imagined a snake in a tree. But I could see that thing. Immediately I made a course change and veered toward midstream and missed passing under the snake by two or three feet. As we passed by, the snake dropped from the tree into the water near us. At the time I thought it was attempting to drop into my boat, but that may not have been the fact of the matter. Possibly it was more afraid than I, although that seems impossible, and was merely trying to leave the area. At any rate it swam away. I thought that snake was a cottonmouth moccasin but it may not have been. I had seen a dead one only a few days before and that memory may have affected my thinking on this occasion. At any rate my first boating trip left something to be desired. On March 20, 2003 the United States of America began an unprovoked attack on the country of Iraq. The stated purpose of this attack was to prevent the usage of stored nuclear weapons by the Iraqi government. No nuclear weapons were present in Iraq, nor were there any means of producing them, but this did not deter the United States from occupying Iraq for nearly nine years, removing the U S presence to some degree, but not totally, on December 18, 2011. With the announced end of troop maintenance there, 17,000 U S yet citizens remain in some capacity. During that period nearly 4,500 Americans died, but that paled in comparison to the Iraqis that suffered the same fate. There is no accurate count, but estimates of Iraqi deaths vary from 100,000 to over a 1,000,000 of the 31,000,000 citizens of that country. If the higher estimate is used, that means 1 of every 31 Iraqis died because of the United States government intervention in their affairs. Although the United States may not agree with the governments of other countries, we are not the world police force and therefore we should stay out of their affairs. Why is the United States yet in Afghanistan? Our stated goal of intervention in that country was to force them to give the U S access to Osama bin Laden. That man (found in Pakistan) has been dead now for several months, but we are still sending our soldiers to a possible death sentence in Afghanistan. Why? When did the United States become such a warmongering nation of people? The fact is, it didn’t. The average person on the street is not hell-bent on forcing Afghanistan to do anything. It is the politicians who desire this. I think it’s high time we brought our troops home for good. Not at some point in the future. Now! I didn’t even start on the economic factors dealing with these two fiascos. Billions of United States citizen’s hard earned tax dollars have been wasted along with the blood spilled in the sands of these desert wastelands. In April 1958 U S Navy Fighter Squadron 174 (VF-174) had its mission changed from fighter to training squadron as it became the sole F8U Crusader training squadron on the east coast of the United States. All pilots assigned to future F8U aircraft squadrons would learn the intricacies of flying the bird at this facility. All fleet squadron maintenance personnel would also be trained here. Two years later, April 7, 1960, I joined the VF-174 Hell Razors as they were known, based in Jacksonville, Florida. I was due to spend some 2 ½ years in that illustrious and coveted position. The previous November 1959 I had been selected as a First Class Petty Officer, an AMS 1, or Aviation Metalsmith Structures First Class. As such it was but a short while until I became the training petty officer for the structures division of the squadron, responsible for the training program for aviation metalsmiths throughout the east coast concerned with the F8U aircraft. I also ordered and received all maintenance parts and supplies necessary for the day to day operations of our division. In mid-October 1962 when I arrived at the squadron one morning there was such a flurry of activity I was hardly sure I was at the right place. As a training squadron we had no use for guns in our aircraft and as a precaution against them being fired by accident the guns were all removed from the aircraft. Now they were all being reinstalled using all manpower that could be made available. Suddenly overnight our mission changed from training to fighter status. It seemed Soviet attack missiles had been discovered on Cuba’s north shore, and that President John F. Kennedy had committed our country to having them removed. We were closer to a possible nuclear war than I hope the world shall ever see again. Thankfully cooler heads kept this possible catastrophe from escalating, in a few days the extreme danger was over, and things quieted back down, but I hope the world never comes this close again to that possibility. Argent on a fess between three cross-lets fitche sable, a cinquefoil of first, pierced of the second. 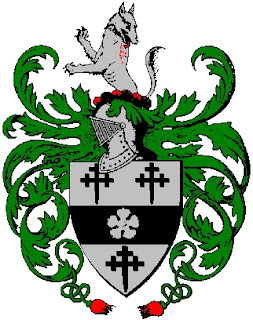 Crest-A demi-wolf salient regardant argent, vulned in the back gule, and licking the wound. Said what? This is what is known as Blazon. Argent is silver or white. Gules is red, while sable is black. A fess is a stripe across the center of the shield. A cinquefoil is a five pointed depiction of a rose. Regardant means an animal facing backwards. Salient means projecting or standing backward. Vulned means wounded. Demi means half. When a helmet is used a Knight’s would have an open visor, while a titled gentleman’s visor would be closed. Either would be shown in profile. Using the Blazon description it means the Lawton Coat of Arms has a silver shield with a black stripe. On the stripe is a rose. There are three crosses of a type called Fitche that appear to pierce the shield. Atop the shield is a half wolf standing and looking rearward. It is wounded in the back, red, and licking the wound. The profile closed helmet shows it is a titled gentleman, but not a Knight. The leafy patterned part is called mantling and is typical of fifteenth and sixteenth century styles. All descendants of the original grantee in the male line were entitled to use the Arms. However only the head of the family could use it as it were, all other family members had to change it in some manner. That is why one can find different depictions of the Arms. Originally the design was placed on a surcoat worn over a suit of armor for ready identification of Knights in battle. That is where the Coat of Arms name derived from. Later it was drawn on shields, pennants, and horse blankets. The total trappings were called the Achievement. At age 16, in 1860, Nancy Fletcher married Thomas Morton in Iowa. In mid 1864 Thomas, in partnership with Nancy’s brother William Fletcher and their cousin John Fletcher, set out on an extended freight shipping trip to Denver, hundreds of miles west through Indian Territory. Nancy, not yet twenty, went along on the journey. They wended their way westward until the night of August 7th when they camped by Plum Creek near its confluence with the Platte River in Nebraska Territory. Shortly after daybreak the next morning between sixty and one hundred Cheyenne braves charged down from a bluff overlooking Plum Creek. The nineteen-year-old Nancy Morton was hit by an arrow in the left side, and by another in the left thigh. As she hit the ground a following wagon struck her. She ran for the river where she saw her cousin, John Fletcher. Just then an arrow struck his chest; he shuddered and died. She spotted her brother hiding in the grass. As he arose telling her to run for the wagons, three arrows hit him. His final words were, “Tell my wife Susan I am killed. Goodbye my dear sister.” Nancy was then taken captive by the warriors. A ransom was paid for Nancy Morton, but after she was released and rode a short distance, she was recaptured. She was ransomed a second time and again recaptured. Finally, in February of 1865, a Government agent was sent with a new tactic. He took a large herd of horses along with him on his journey. At strategic spots he left them in pairs, ever closer together as he neared the Indian encampment. When he paid the ransom and Nancy was released, he raced away from the encampment with the Indians once more in hot pursuit to recapture their valuable commodity. The agent and Nancy stayed ahead of the pursuers until they reached the first pair of awaiting horses. They rapidly switched animals and began leaving the Indians with their tiring mounts behind. This procedure was used again and again the entire distance back to safety. She always recalled that she had been treated with the utmost respect, the Indians keeping her merely as a source of wealth. 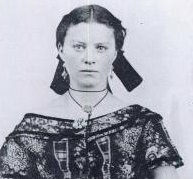 On November 19, 1865 this tenacious frontier woman remarried, this time to George Stephens. In August of 1866 she gave birth to her first of three children, a daughter she named Eveline. When Eveline was nineteen, in February of 1886, she married William Lincoln Lawton, the son of Philip and Jeanine (Gault) Lawton, born respectively in England and Scotland. William and Eveline had one daughter, Lulu Maud Lawton in 1893. She married Smead H Purinton. October 15, 1962 Aircraft photography revealed missile launchers under construction on the island of Cuba. October 22, 1962 President John F. Kennedy announced their existence to the American public. He also declared a quarantine of the island, a blockade, nothing in, nothing out. He further stated to the Soviet Union to remove their missiles from Cuba. Low-level photo flights were ordered every two hours over Cuba. October 25, 1962 As the entire world held its breath, waiting for the other shoe to drop, the United States military, mightiest in the world, was placed on the highest status possible. October 26, 1962 The Union of Soviet Socialist Republic (USSR) Premier Nikita Khrushchev wrote President Kennedy that the USSR would remove the missiles if the United States would promise never to attack the Cuban island. October 27, 1962 A United States U2 photo aircraft was shot down over Cuba. October 28, 1962 Premier Khrushchev agreed to the United States demands and the excruciatingly tense threat of the unthinkable nuclear war was staved off for at least a short period of time. The collective world breathed a sigh of relief as tensions slightly relaxed. As was true of the later experience of the twin tower disaster, millions of people can relate where they were during the missile crisis. I was in a U S Navy fighter training squadron in Jacksonville, Florida. At the very beginning of the crisis our status was shifted from training to a full-fledged aircraft fighter squadron. All aircraft guns were loaded and tested for readiness. Their wings fairly bristled with live missiles of various types. All leaves were cancelled immediately. Some aircraft were on the runways with engines idling at all times. Others were ready for backup at a moment’s notice. Much later it was learned that Fidel Castro, leader of Cuba, recommended to Premier Khrushchev that nuclear missiles be fired at the United States. He fumed mightily when it was not done. The madman knew not how stupid that would have been. Had a single missile been launched from Cuba at that time the world stood a grave danger of being annihilated. There was a time in my life when I held a part-time second job taking care of a string of vending machines. Some of them had candy bars, while others had cold drinks, and still others held hot soup and hot beverages. Most, but not all, were in enlisted military living quarter areas. Once a day I made the rounds with my personal vehicle supplying the machines, extracting the coins, and insuring their proper working order. If they had minor problems I might fix them on the spot, but if it was a larger malfunction I reported it to higher-ups that sent in repairmen. On occasions a machine might malfunction in such a manner as to yet accept coins but not give forth the desired product. It was possible for several dollars to accumulate before some caring individual might place an out-of-order sign on it. When I arrived on the scene under these conditions I would make an attempt to understand the problem and repair it if I was able. Often it was caused by some person attempting to get something from the machine under dubious circumstances. In other words a false object of some sort was inserted in the coin slot in an attempt to gain a free product. In most cases this was a dishonest attempt to steal the product, but one could not state that as always true. Given the benefit of the doubt, it was possible the object was inadvertently inserted, such as a coin-like object might have been in a person’s pocket, and without looking at it could have been placed in the coin slot. So, was this an honest mistake, or a dishonest attempt at minor theft? By taking a quick inventory of the machine I, of course, knew how much money should have been in the coin box. If there were several dollars extra, who did the money belong to? It, of course, belonged to whoever had placed it in the coin slot and received no product in return, but that would have been nearly impossible to determine. In actuality, if a person walked up to me while I was there, and stated he lost a quarter in the machine, I merely handed him a quarter with no questions asked, but I yet walked away with more money than was necessary to account for lost inventory. Sticking with my honesty point of view who then owned that excess money? It was not my money merely because it was in my possession, yet had I kept it no one except me would know. It did not belong to the organization I worked for as they had done nothing to earn it. There was no practical way to determine the rightful owners and return it to them. In reality I turned in the total amount of money in any machine whether it was over, or under, the required amount to offset inventory. I bring up the question to illustrate that under some circumstances it is nearly impossible to be entirely honest, no matter how much it be desired. My brother Dell and I were out hunting rabbits on a dreary sort of a Sunday morning in December during the late 60s on the Naval Air Station north of Meridian, Mississippi. Both of us were in the Navy, but that had little to do with what we were doing. We belonged to the Base Sportsmen’s Club and therefore hunted the Base woods and meadows for rabbits nearly every weekend during the fall season. On this particular day we had a pack of six beagles out working for all they were worth, but nothing seemed to be moving, probably due to the moderate rain that was falling all morning. We tried several separate areas, each time gathering the dogs up and placing them in the back of my 1948 Jeep CJ1, and moving on to some other well-known (to us) area. After three or four hours of this even we gave up. We decided it was time to gather in the dogs, pack them into the Jeep, and head for our respective homes. I blew on my silent whistle and my Sue dog readily came. After we placed her in the dry Jeep Dell began gathering up his dogs. He had never trained them to the whistle, and some readily came to his voice call, while others were not so ready to go back to their humdrum life in a wire fenced run. Becky and Joe both came and we put them in the back with Sue. After some more calling another showed up and we captured it too. The last two were not so ready to cede to a rabbitless day. Dell decided to walk into the nearby woods after several minutes to bring them out to the Jeep. Dell always carried two or three chain type leashes in a coat pocket. Being chain they would fold into a pocket readily, and he hardly knew he was carrying them. After a few minutes in the woods he appeared at the edge headed back toward the Jeep. I watched him approach until he was no more than fifty yards away from me. He had a beagle on a leash in each hand and walked steadily toward me in the ever steady-falling rain. When he got to that distance, suddenly a rattler sprung up out of the grass directly in front of him. It seemed to strike at him, but somehow missed its target and went harmlessly past his left leg. Possibly that was all it intended to do. As it passed through between Dell and the beagle on that side the Beagle tried to take a bite out of it, but it too missed its intended target. I looked on in horror with absolutely nothing I could do at that distance. Had I even been expecting it to happen I could not have shot it, but I didn’t even have a gun loaded, much less was I thinking of shooting the snake. Dell stopped dead in his tracks, frozen in an uncontrollable fear. I called to him, but no answer, nor movement, was forthcoming. I slowly walked toward him watching for any sign of the snake, or any other, carefully placing each footstep as I got closer. When I got right up to him I spoke his name. There was still no answer. I then slapped him, and in an instant he was normal again, with no recollection of the past few moments. He didn’t know how I had got from the Jeep to where he was without his seeing me arrive. He didn’t recall seeing the snake either. He had no idea I had struck him. We put the last pair of dogs in the Jeep and headed for home. Soon we had dipped the dogs in tick medicine, and put them back in their pen where they immediately went into their shelter and shook spreading the medicine within the structure. Only then did we enter the warmth of his home, and after removing our thoroughly wet outer clothes, and wiping down our shotguns, we each enjoyed a good hot cup of coffee. December 24, 1960, Christmas Eve, I was 22 years old the previous July. A good friend named Rodney D. (Rocky) Lewis called and asked if I could help him change a rear wheel bearing in his car. He was from Georgia, and he and his wife and daughter wanted to go home for Christmas, but the wheel bearing had gone bad during the day. We removed the back axle with the attached wheel bearing. We took it to a parts place where we thought they would use a hydraulic press to remove and reinstall a new bearing on the axle for us. They had no mechanic on duty because it was Christmas Eve. We tried several places all with the same result. We then returned to Rocky’s home. I decided we could remove the old bearing somehow, and the new one would not be difficult at all to replace. I tried to pry it off with several available tools with no luck. In desperation I picked up a hammer and cold chisel in an attempt to cut it off. I made little headway until I picked up a larger hammer. When I swung the sledge, the bearing broke and pieces flew everywhere. It was only a few minutes later until we had the new bearing in place and reinstalled the axle in the car. Rocky, Harriett, and the baby were good to go, but for some reason I was seeing black spots in front of my eyes. When Rocky returned from a short test drive I told him I needed to go to a hospital as I had something wrong with my vision. From the clinic on Cecil Field I was removed to the US Naval Hospital at the Naval Air Station Jacksonville a few miles distant. X-rays showed that I had some retained foreign bodies deep within my right eye and it was bleeding internally. Pieces of magnetic steel, non-magnetic steel, and cement from Rocky’s porch steps were all embedded within the eye. With the use of an electromagnetic needle the magnetic particles were removed by Doctor Lauuwe, but the remainder of the particles stayed where they were. After six weeks of bed rest with bandaged eyes I was finally allowed to arise, but with very little vision in that eye. I spent about half of 1961 in the hospital and the other half on light or limited duty.